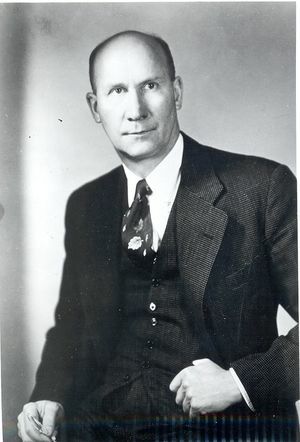 John T. Henderson, IRE President, 1957, joined the National Research Council of Canada’s staff as the head of the radio section. John T. Henderson was born on December 9, 1905, in Montreal, Canada. He received the B.S. and MS. degrees in engineering physics at McGill University in 1927 and 1928, respectively, and the Ph.D. degree from the University of London in 1932. He carried out ionospheric experiments during the total solar eclipse in Canada in 1932, and studied further in Munich, Germany until 1933. In 1933 Dr. Henderson joined the staff of the National Research Council of Canada in Ottawa as head of the radio section he participated in direction-finding experiments on atmospherics in Ontario and Manitoba which gave rise to the development of a shortwave cathode-ray direction finder, widely used by the Royal Canadian Navy during World War II. In 1939 Dr. Henderson represented Canada at the first official disclosure of British radar to the Commonwealth countries. He returned to Ottawa to start similar work at the Council, directed the development of radar equipment for the armed services, and contributed in organizing the radar division of Research Enterprises Limited, a Crown Company for quantity manufacture of the Council's wartime developments. From 1942 to 1946 Dr. Henderson served as an officer in the Royal Canadian Air Force, where he was concerned with the installation and operation of the early warning radar chain in Nova Scotia, Newfoundland, and Labrador. He later served overseas. Returning to the National Research Council, Dr. Henderson was the Canadian delegation's scientific advisor to the United Nations Atomic Energy Commission. Back in Ottawa, he headed a group studying the application of radar to surveying, and succeeded in evolving methods now used extensively in northern Canada by the Dominion Geodetic Survey and Royal Canadian Air Force. In 1949 he took charge of the Council's electricity laboratory to expand its scope and set up new absolute electrical standards for Canada in conformity with international agreements. Dr. Henderson joined the IRE in 1928 as an Associate, became a Senior Member in 1947, and was elected Fellow in 1951. A member of the Ottawa Section, he was Vice-Chairman in 1949-1950, Chairman in 1950-1951, and Director of the IRE Canadian Region from 1953 to 1956. Henderson was president of the IRE in 1957. He was the first Canadian to hold the office. This page was last edited on 1 February 2016, at 17:11.